"Riveting and brilliant...journalism at its very, very best." 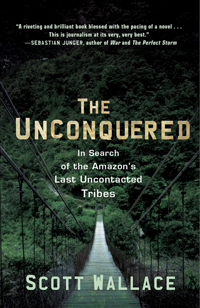 The Unconquered tells the extraordinary tale of a journey into the deepest recesses of the Amazon to track one of the planet’s last uncontacted indigenous tribes. In this gripping first-person account of adventure and survival, the author follows a 34-man team into the Amazon’s uncharted depths, discovering the rainforest’s secrets while moving ever closer to a possible encounter with the mysterious flecheiros – or “People of the Arrow” – a seldom-glimpsed tribe of deft archers known to defend their lands with showers of deadly arrows before melting back into the forest shadows. On assignment for National Geographic, author Scott Wallace joins the brooding and charismatic explorer Sydney Possuelo on a quixotic mission: penetrate the jungle redoubts of the Arrow People, gather crucial information about them, and return to civilization without contacting the tribe. As head of Brazil’s Department of Isolated Indians, Possuelo seeks to protect the Arrow People and their rainforest homeland from the ravages of the advancing frontier. But the information he needs to safeguard them can only be gleaned by entering a world of darkness and danger beneath the forest canopy, to seek out the untamed tribesmen while at the same time trying to avoid them. Laced with lessons from anthropology and the sweep of history, and boasting a Conradian cast of unforgettable characters—all driven by a passion to preserve the wild, but also wracked by fear, suspicion, and the desperate need to make it home alive—The Unconquered reveals this critical battleground in the fight to save the planet as it has rarely been seen, wrapped in a page-turning tale of adventure. "A search for a wild people in a last wilderness on an expedition that is scarcely conceivable anymore. A true adventure...exciting and authentic -- a great pleasure to read. " "A riveting and brilliant book blessed with the pacing of a novel but carrying the great weight of world events. This is journalism at its very very best. " "Scott Wallace has written an absolutely wonderful and gripping account of his journey into the Amazon. Along the way, he shines an important light on this fascinating land and its still unknown people." "The Unconquered is not only a riveting story—crowded with vivid detail and heart-stopping moments—but a first-hand account of a rare and critically important expedition. Wallace and the men with whom he traveled risked their lives navigating the territory of the flecheiros, one of the most isolated and dangerous tribes in the Amazon. The story Wallace returned with will keep you up at night." "Exquisitely observed and beautifully told, The Unconquered ranks among the very best of modern adventure stories, even more so for the profound questions about man and nature that it explores. " "The Unconquered may be the most engrossing and profound recounting of an Amazon adventure since that long-ago masterpiece, Tristes Tropiques." "Scott Wallace's superbly-written account is as riveting as one of the old explorer's classic memoirs. Reading The Unconquered left me with a sense of awe that we share this world with people like the flecheiros — and profoundly moved by the inevitability of their extinction. It is a one-of-a-kind book about a one-of-a kind experience, and it is difficult to imagine that there will be many more like it." "Like his legendary predecessors Col. Candido Rondon and the Villa Boas brothers, Sydney Possuelo is a national treasure in Brazil, one of an extraordinary lineage of frontiersmen and humanists who have put their lives on the line in order to protect the unconquered, the last survivors of El Dorado, the uncontacted tribes of the Amazon. In this wonderful book, Scott Wallace -- a veteran chronicler of the Amazon -- accompanies Possuelo on an expedition into the most remote reaches of the unknown. This result is an astonishing account that reveals all the drama, passions, contradictions, and dangers inherent in the quixotic yet essential devotions of a cadre that for more than a century has truly lived by the motto, 'Die if you must, but never kill.' "
"Scott Wallace writes with great verve about an amazing adventure, a journey informed by his deep knowledge of the history and anthropology of the Amazon." "Scott Wallace brings back such riches from this expedition: great characters, deep paradoxes, adventure, wonder, pain. What a yarn! This consummately remote world, the Amazon wilderness, comes thickly to life on the page." "Scott Wallace leads us through uncharted tributaries of the Amazon to the edge of one of the last uncontacted communities in the world, the ferociously private and enigmatic Flecheiros -- the "People of the Arrow". Along the way, we meet a cast of fascinating and complex characters, the star of which is the brilliant and charismatic explorer Sydney Possuelo. I've read as many works on this topic as I can find. This is the best by far."